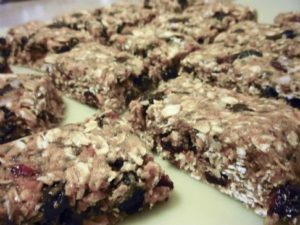 Parents, here are some great snacky recipes to make for your family and athlete. These are made with clean ingredients and can have in your fridge and ready to grab out the door for school or game day! Pics of the food coming! Look for more recipes on our blog! Place bars in fridge overnight. Cut into 8 bars and wrap individually in plastic. Store in refrigerator. Preheat Oven to 250*. Spray 9 x9” pan with cooking spray. Combine wet ingredients in mixer bowl. doesn’t overcook. Center should be gooey and sides firm. naturally fall apart / shred with tongs once it’s done. the chicken and pour 1/3 of the sauce over as evenly as possible. Place 1/3 of the cheese over that. remaining tortillas, sauce and cheese only. Bake approx.. 20 minutes or until cheese on top looks toasty. spinach is wilted. Place in pan. Whisk the whole eggs and egg whites together in bowl and add spices.